Macarons - my latest obsession! Except, the macarons that I'm featuring today or not mine but Connie's, the owner and creator of Mirabelle Macaron in Edmonton. In fact, in my quest for baking a successful batch of macarons, I've had the wonderful opportunity to bake with Connie. 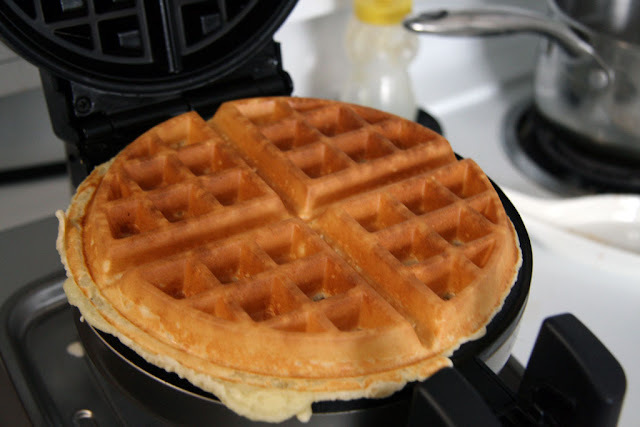 Recently, Connie had a mini 'macaron tweetup' and a few of us had the privilege of sampling some of her delicious wares. Check them out! A box full of deliciousness and likely a macaron attack! In my understanding, Connie's macarons have the same characteristics that all macarons should embody: that is, crispy-but-not-too-crispy shell with a soft chewy texture complimented by a flavoured buttercream or ganache filling. Prior to Mirabelle Macarons, to purchase macarons in Edmonton you had to visit my favourite place, Duchess Bake Shop. So, it's only natural to want to know what the difference is between Mirabelle Macaron's and Duchess' macarons. So far, I can tell you that Connie's macarons are on par with Duchess. It's exciting to see someone experiment with flavours that I have not had a chance to try in Edmonton (such as her Milk Chocolate Passionfruit). 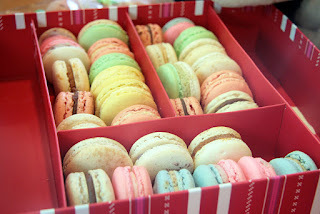 Of the many macarons flavours that Connie brought for us to sample here are a few that I tried that day. When you bite into the Milk Chocolate Passionfruit macaron you get the crunchy texture of the macaron shell, followed by two flavours; first of chocolate and then immediately passionfruit. This makes a very good tasting macaron! The matcha green tea macaron has a matcha buttercream filling between its two coloured shells. Matcha is the main powder used to make Japanese Green tea and found commonly in green tea ice cream! 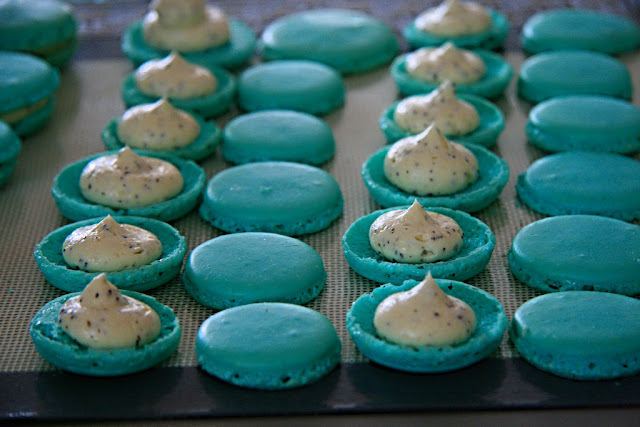 It's a very light flavour in general, but Connie's macarons were able to convey the flavour very well! Mirabelle Macaron's Passionfruit cream macaron is similar to the milk chocolate passionfruit cream macaron but without the chocolate ganache. The passionfruit flavour offsets the sweetness of the macaron shell thus making it a good combination. The chai-flavoured macaron pictured below has a chai flavoured buttercream and is dusted with cinnamon. I took a picture of the half-bitten macaron to show that there are no air pockets in these macarons! From my own personal attempts at making macarons, I know that having no air pockets is extremely tricky to master as you do not want to overmix during the macaronage process. 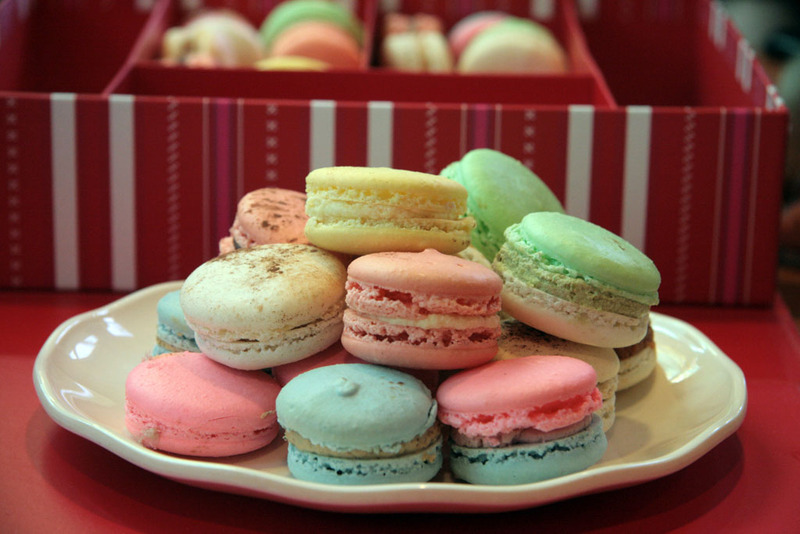 Connie's Berry Cream Macaron has multiple berry flavours infused into the buttercream. I really think that Connie excels in incorporating strong fruit flavours into the ganache and buttercream. If you want to try out Mirabelle Macarons you can order them by contacting Connie on her website www.mirabellemacarons.com. She'll also have a booth at the Edmonton City Market Downtown on December 3rd 2011. If you want to learn how to make macarons, Connie is also teaching a macaron making class in February 2012. You can register for the class through the Taste Tripping website. Love your blog and i need your help to find out why my macarons' shells are hollow meaning that the thin crispy top layer is separated from the chewy inside...are they supposed to be like that?? Let me know how I can help! sometimes even the best macaron makers such as Pierre Herme ends up having a slight hollow in their shells. Even when you take a look at his pictures you will notice it. there are so many different reasons for hollowness in a shell but as long as there is not a lot then you should be fine! Take a look at my other recipes including following along with the macaron 101 to get more tips and tricks to making macarons. do feel free to email me! If you live in Edmonton you can buy them from Duchess.